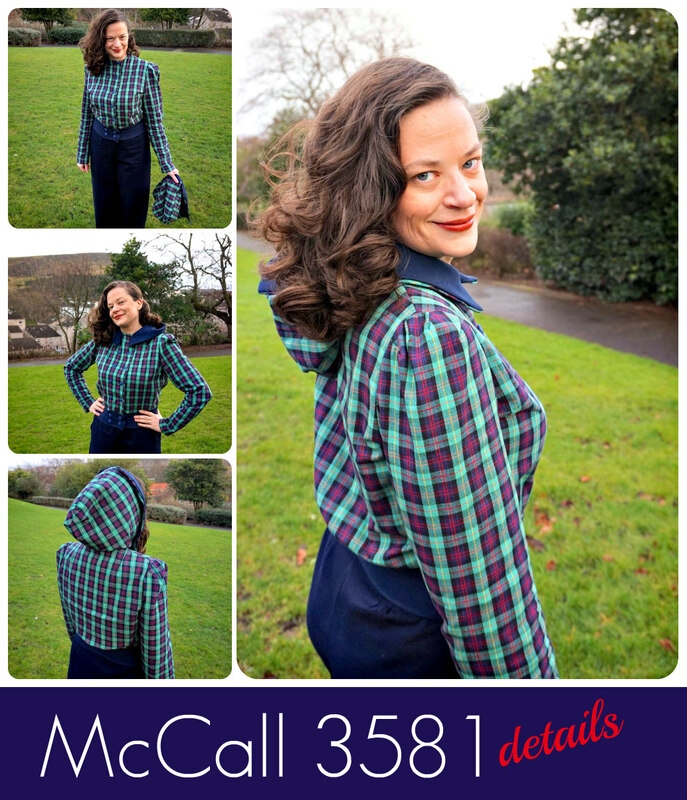 I'm super happy to showcase my latest 1940 McCall make – a hooded windbreaker jacket. 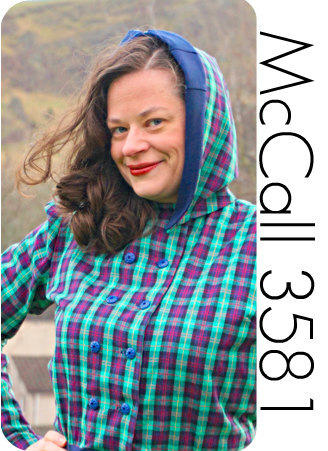 McCall 3581 is an ADORABLE pattern. 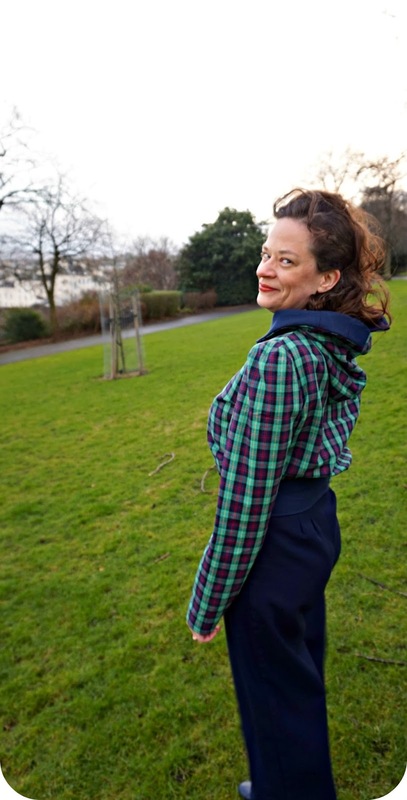 How can you go wrong with a windbreaker that has a nipped in waist, slightly puffy back, pleated sleeves, detachable hood and double-breasted closing? This fabric is a reversible fabric that has tartan on one side and a great blue fabric on the other. It's a medium-weight which is perfect for a windbreaker. I had to grade up the pattern by 2 inches and normally this wouldn't be a problem but for some reason, I totally messed up the waistband! I think I must have forgotten to grade it because it was about 4 inches too small. 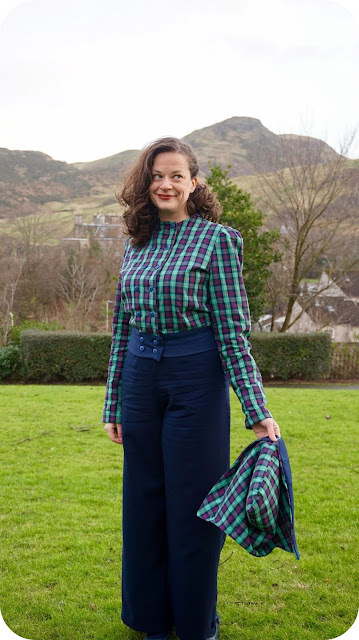 The worse part was that I did not have any remaining tartan fabric! Which made this cute little jacket go into the UFO pile for about a year. I pulled it out again to try and think what I could do to save it. 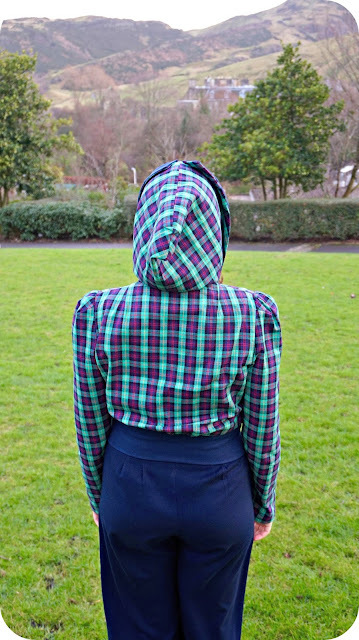 I decided that it might be cute to do a waistband and hood lining in a navy blue fabric that I had in my stash. It was a very close blue colour to my already existing 1941 trousers and 1940 skirt – which meant I could wear the windbreaker jacket with both. I excitedly set to work and I think it worked out great with the different colour waistband! I really love the silhouette of the jacket. 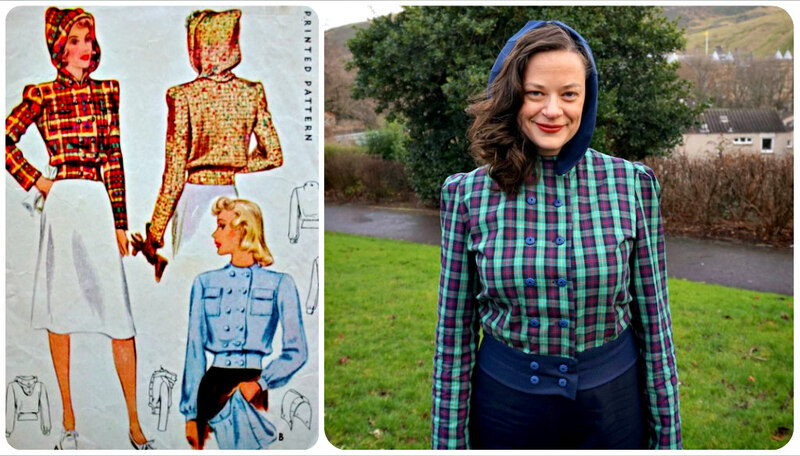 Pleated sleeves are my FAVOURITE and the extra puffiness in the waist back of the jacket looks great with the more form fitting waistband. And the bottom front of the jacket almost lines up. 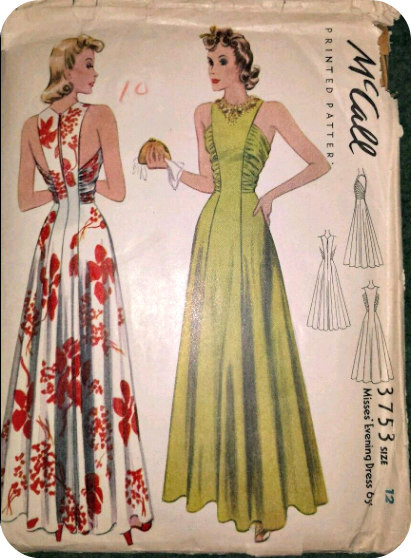 I might need to move one of the bottoms on the waist front to avoid the overlap difference at the bottom. And how awesome is it that the hood is detachable? 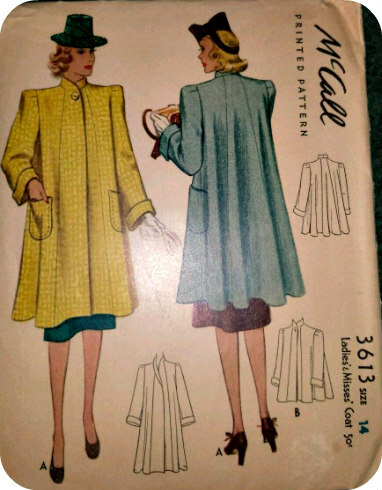 There are four buttons on neck of the jacket (the two functional buttons at the neck front and then one on either shoulder seam) that hold the hood in place. 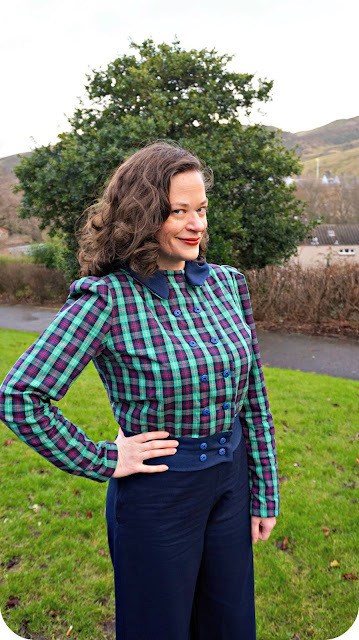 With the tartan fabric, you hardly even notice the buttons on the shoulder seams! 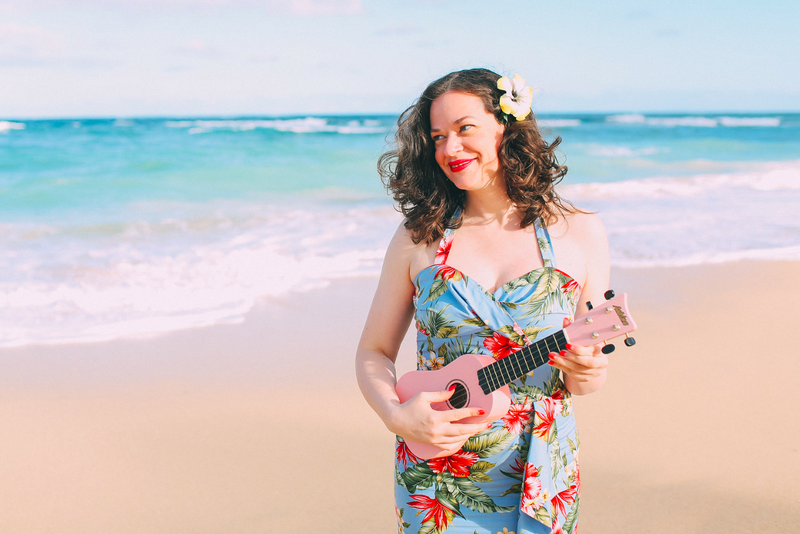 Overall, I am VERY happy with my first 'sporty' 1940 make. It goes with so many pieces in my wardrobe and will definitely come in handy with the Scottish weather! What about you? Yea or nay for double-breasted jackets? for hoods?